These days, it’s easy to believe that weight determines health. Weight loss is a common recommendation, but is that what really leads to health? Weight may be correlated with increased disease risk, but correlation isn’t causation. In fact, when studies control for lifestyle factors, any risk associated with weight dramatically decreases or disappears. In reality, health is determined by healthy behaviors, not by weight. If someone adopts healthier behaviors and weight loss happens as a result, the change in weight is not what determines health. Therefore, if someone adopts healthier behaviors and doesn’t lose weight, it doesn’t mean that the person hasn’t improved their health. Let’s give the credit to behavior change, not weight loss! One specific healthy behavior I recommend often is eating regularly, consistently and adequately. Unfortunately, if someone is overly concerned with weight loss, eating habits are usually irregular, inconsistent and inadequate. This only serves to suppress metabolism. You can think of metabolism as an umbrella term for every metabolic process your body performs, even down to the cellular level: cell turnover, energy production and energy metabolism, producing hormones and maintaining their balance, making neurotransmitters and other neurochemicals that function in the brain, digestion, digestive enzymes, motility, structure and function, sleep cycles and rhythms. Everything your body does, even those things it does without you ever knowing, is your metabolism. These metabolic pathways can only do their job with required nutrients — vitamins, minerals, antioxidants, phytochemicals, glucose, amino acids, fatty acids, etc. Every body process functions better with consistent, regular and adequate nutrition. While we do measure metabolic output in calories, we don’t feed metabolism with calories, and calorie restriction usually means inadequate nutrient intake, leading to a lower metabolic output. Translation: Not eating enough just lowers your metabolism, while eating adequately can normalize it. Your body is wired for survival, and it will adapt to dieting, especially after multiple dieting attempts. The good news is that metabolism is flexible and can be restored with adequate energy and nutrient intake. You’ll have to understand that your body is confused, so it may take patience and consistency for your body to adapt to a new well-nourished and satisfied state. You can think of all these metabolic pathways as links in a chain with a domino effect; one leads to another. You can imagine then that if a metabolic pathway doesn’t have the materials it needs to perform, every pathway after it will not be able to perform its function either, decreasing your metabolic output. Your body is always talking to you, and if your metabolism is not functioning at its full potential, you will likely notice signs such as fatigue, poor sleep quality, poor exercise tolerance, headaches, digestive issues, hormone imbalances, nutrient deficiencies, blood sugar fluctuations, etc. The common response to those concerns is to be more restrictive with food, cutting out whole food groups or certain food substances — but this will likely create more issues than it solves. Eating a wide variety of fresh, wholesome foods and having a flexible approach to meal patterns while honoring intuitive signals of hunger and fullness will be the best way to support a healthy body and mind. The best indicator of a metabolism functioning at its full potential is how you feel, not what you weigh. 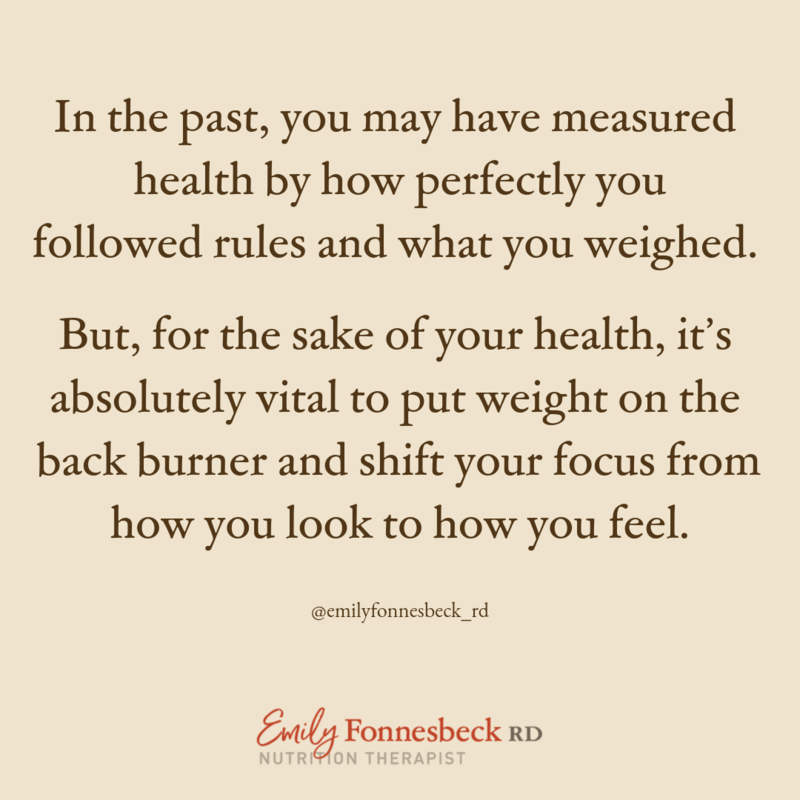 In the past, you may have measured health by how perfectly you followed the rules and how it affected your weight. For the sake of your health, it’s absolutely vital to put weight on the back burner. Instead, I encourage you to shift your focus to how your body feels and functions. When weight loss is driving motivation, health (in body and mind) suffers. I encourage you to cultivate habits that support your well-being, regardless of weight and body shape. Health comes in a variety of shapes and sizes, and it will look different on every body.